Art is nothing but a narrative and this August, Anubhav Nath- Curatorial Director of Ojas Art Gallery presents Satrangi- an annual show of Bengali Pattachitra Art by Ojas Art Awardees on Friday, August 10. Featuring the two Ojas Art Awardees Anwar Chitrakar (Master Artist) and Uttam Chitrakar (Protege Artist) along with Dukushyam, Moyna &amp; Joydeb and Swarna Chitrakar. Paintings can speak and the renowned Bengal Pattachitra Art too is known for its story telling approach to art. Painted scrolls have long been used to document and narrate stories and also bring attention to social causes with wit, humour and satire. This vibrant and expressive folk art by the patua community from West Bengal is celebrated, cherished and sustained even today with the help of artists like the one that will be featured at this exhibit. The participating artists are experts of their field having participated in the fourth edition of the prestigious Ojas Art Award and exhibited their art works at Zee Jaipur Literature Festival 2018. The award co-organized between Teamwork Arts, producer of the Jaipur Literature Festival, and Delhi-based art organization OJAS Art. 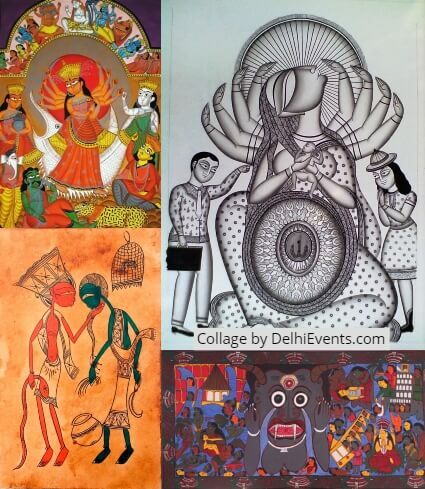 In 2018 the award focused on excellence in Bengal Pattachitra Art. A traditional Patua artist trained in 19th century Kalighat style of painting, Anwar Chitrakar is received the Ojas Art Award Master Artist 2018. Traditional myths and stories form the basis of his work which will be on display at the exhibit. An individualistic artist expressing his traditions and his belief systems in a more contemporary manner, his works will enrapture the spectators. “I believe that art has a language. It makes the spectators feel! Satrangi is an Annual exhibition and explores one genre of tribal arts annually. Previously there have been survey shows in the genres of Gond, Madhubani-Mithila and Bheel and this year we celebrate Pattachitra. The aim to bring forth this traditional art techniques and keep the skill alive and appreciated”, says Anubhav Nath, Curatorial Director, Ojas Art. Born in 1980, Anwar Chitrakar is a traditional Patua artist trained in 19 th century Kalighat style of painting. Over the past 25 years Anwar has evolved into a more individualistic artist, expressing his traditions and his belief systems in a more contemporary manner. Traditional myths and stories form the basis of his work, which stem from his background as an artist and storyteller. He received the Ojas Art Award Master Artist 2018. Anwar has won West Bengal State Award in 2002, National Award in 2006 and Presidents Award amongst others. Anwar has participated in many exhibitions in India and abroad, such as the Berlin Festival 2012, Namaste India Festival Japan, 2012, Devi Art Foundation ‘Vernacular in the Contemporary’, Precept Gallery, Mumbai ‘Roop’ and others. His paintings are part of the collection at the Victoria and Albert Museum, the Mumbai International Airport and are also held in private collections. Born in 1991, Uttam Chitrakar started learning painting at the age of 9 from his father. Initially, he was not interested in painting but after getting married to Sonali Chitrakar, daughter of Swarna Chitrakar he has taken painting seriously. He has learned painting in detail from Swarna Chitrakar. Most of his works depicts the Babu Culture which is the prime theme of Kalighat style of Pattachitra. He received the Ojas Art Award Protege Artist 2018. He is associated with State Govt. of West Bengal for various projects. His artworks are exhibited in Goa, Chitrakala Parishad (Bengaluru), IGNCA (Delhi), Victoria Memorial Hall (Kolkata), Crafts Museum (Delhi), Mumbai, American Centre, CIMA Art Gallery, Baitalik Gallery (Kolkata) and many more. Born at Naya village in West Midnapur, 44 years old Swarna Chitrakar belongs to the family of Patuas. She learned paintings from her father during her childhood. At the very early age she got married and after her marriage she faced troubles. After a year she went back to her parents’ house and started reviving her painting skills. Swarna got State Award in 1994 and District Award in 1995. In 1996 she was invited to participate at a grand fair in Kolkata. That was the beginning of her career and the painter from Naya hasn’t looked back since. She has participated at major festivals in France, Germany, Australia, USA, Sweden, China, London, and all over India to showcase her creations. Swarna specializes in painting on issues related to women empowerment. She has painted on themes like female infanticide,trafficking of girls, the story of Nirbhaya and also sings songs composed by herself on these themes. Her works are on collection at CIMA Art Gallery and Ganges Art Gallery, Kolkata. Her books ‘The Patua Pinocchio’ in collaboration with Carlo Collodi and ‘Monkey Photo’ in collaboration with Gita Wolf were published by Tara Books.